− two = two Required Please enter the correct value. Gold prices posted their best one-day performance in nine months yesterday (Thursday) with a 3.4% surge, and they are following it up with another gain today. Our up-to-date gold price chart shows June's rally after May's record lows. As of mid-day today, gold for August delivery was up 0.12% to $1,315.70 an ounce on the Comex division of the New York Mercantile Exchange – about a $42 increase on the week. Spot gold traded around $1,315.40 Friday afternoon. 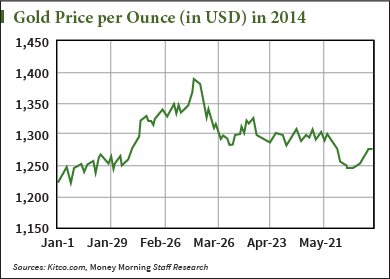 Our new gold price chart reflects the yellow metal's rally from around $1,200 an ounce to almost $1,400 early in 2014. For the last two months, gold sank below the $1,300 mark and has struggled to come back. This week's late gains finally broke the slump, and gold prices rocketed past the $1,300 threshold to put them on track for a 3% weekly gain – their biggest since mid-March. Geopolitical tension in Iraq and Ukraine and a weaker dollar are contributing to the upward surge in gold prices. The safe-haven investment tends to enjoy gains when fear is in the air. But that's not the only reason gold prices skyrocketed this week. The Federal Open Market Committee held its fourth meeting of 2014 on Tuesday and Wednesday. Chairwoman Janet Yellen said in a press conference thereafter that the nation should expect faster growth in the economy in 2015 and 2016. She also announced the Fed will continue to reduce bond buying by $10 billion. 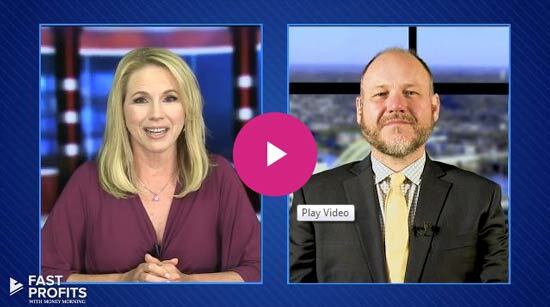 "Here's what's most interesting: Official CPI (Consumer Price Index) stats show inflation is up 2.1% year over year," Money Morning Resource Specialist Peter Krauth said on Friday. "Should it continue at this rate, we'd see 3% by late this year." That's important information for goldbugs. With the strong inflation reading, many expected the central bank to say it might start raising interest rates earlier than expected, according to The Wall Street Journal. That would be bad news for gold prices, which typically weaken when interest rates go up because investors seek out higher-yielding assets. But Yellen flat-out dismissed rising inflation. She called the data "noisy" and reiterated that the Fed won't raise interest rates until sometime in 2015. "Besides the Iraq insurgence and U.S. dollar weakness, I think Fed action may actually be one of the big reasons why gold shot up yesterday, gaining nearly $44 in a single day, good for a 3.4% gain," Money Morning Resource Specialist Peter Krauth said on Friday. Thursday's record gold price gain isn't the only notable news for the yellow metal.